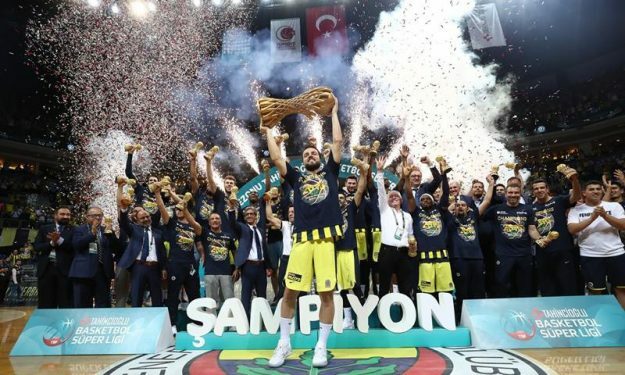 Fenerbahce completes the season with the Turkish BSL three-peat. Fenerbahce routed Tofas Bursa 94 – 64 at home in Game 5 of the Turkish BSL League Finals to prevail 4-1 in the series and win the title for the third season in a row, the fourth time in the last five years and ninth time overall in the history of the club. Coach Zeljko Obradovic‘s players dominated the match nearly from start to finish. They closed the first quarter ahead 25 – 12 and reached halftime up by 19, 45 – 26, pretty much transforming the rest of the game into a “standard procedure” since Tofas couldn’t recover from such a deficit. Ahmet Duverioglu scored a game-high 19 points and grabbed nine rebounds for Fener while Brad Wanamaker added 11 points en route to winning Finals MVP. Egehan dropped 10 points and Kostas Sloukas pitched in eight points and eight assists. From Tofas, that played minus forward/center Raymar Morgan, Pierria Henry flirted with triple-double by notching 17 points, nine assists, and seven rebounds. Kenny Kadji added 12 points. It has to be noted that Zeljko Obradovic coached the game after making a flash round-trip from Istanbul to Athens to attend the funeral of former longtime Panathinaikos owner and president Pavlos Giannakopoulos.